Last year an overhaul of the tax code was passed by Congress and signed into law by President Trump. We thought we would put together a resource page on the aspects of the law that will affect agricultural producers. First, a rather lengthy article covering all aspects of the new law that will affect agricultural producers. This piece is written by Roger McEowen, an agricultural tax lawyer in Kansas. I have confirmed with the author that the information in this article is up to date. Second is a post by another agricultural lawyer focusing primarily on the estate tax changes. Finally, a 17 minute radio interview on major tax and agricultural law issues for the new year. In a recent survey of agricultural lenders from across the nation conducted by researchers at the University of Georgia and Kansas State University, agricultural lenders indicated that non-performing loans increased and lenders expected this pattern to continue in the short and long term (Brewer et al., 2017). 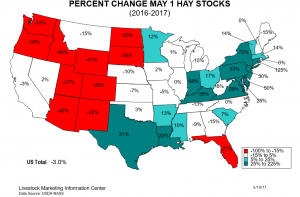 Agricultural lenders were asked if they experienced an increase in non-performing loans in their loan service territory over the past three months as well as their expectations for non-performing loans over the short and long term for their loan service territory. This expectation is the strongest reported by agricultural lenders in the past two years. 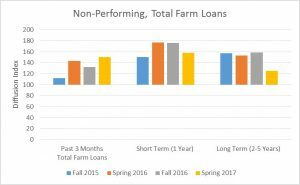 Lenders reported an increase in non-performing loans for total farm loans (see graph), farm real-estate loans, and operating loans. This expectation of increased delinquency represents deteriorating cash reserves farmers have given lower net farm incomes experienced nationally. The first step for farmers that may be at risk of becoming delinquent or past due on notes is to calculate their working capital position. Working capital is the amount of cash or near cash assets on hand after all current liabilities (e.g. expenses, current portions of long term debts) are paid. Working capital can be seen as the buffer for a farm to absorb any short term losses. It can also be seen as a measure of financial risk for the farm. The greater the working capital, the less financial risk a farm has. Farmers who are experiencing liquidity or working capital issues should implement strategies to prolong cash reserves for as long as possible. These strategies include: negotiating any long term leases, a thorough review of all operating expenses, prioritizing asset purchases, culling of old or unproductive assets, and sharing of assets if possible. These strategies will help minimize losses and make the farm more efficient in hopes of bolstering the working capital positions of farmers. It is also important that farmers be open and up front with their lenders concerning any possible late payments or cash flow issues that may hinder loan repayment. Lenders have reported that they are more flexible with farmers who provide advanced notice of financial issues. This provides the agricultural lender time to develop a plan that could be mutually beneficial for both the farmer and lender. Most farmers are familiar with the method of cash-based accounting. With cash-based accounting, a farmer records income when they receive a cash payment for their crops, animals or animal products. Furthermore, they record an expense when a payment is made by the farmer to the input supplier (fertilizer dealer, seed company, etc.). Cash-based accounting does not value accounts receivables and inventories as income, nor accounts payable as expenses, until cash is exchanged. Accrual accounting, on the other hand, means a farmer records an income or expense transaction when it is incurred, regardless of when cash is exchanged. To expand on this, the accrual method records the income of the farm in the year it was produced by the farmer and also records the expenses incurred in producing that income. Accrual income can include cash from the sale of products, accounts receivables for products sold, and inventories of crops and livestock produced. Expenses measure the costs incurred to generate income for the year and may occur with or without an actual cash payment (accounts payable). Accrual accounting essentially matches income earned to expenses incurred, giving a more realistic reflection of net income for the year. Net income indicates profitability of the farm. Cash-based accounting can be useful for managing taxes. For example, a farmer pays for his fertilizer and chemicals in October of year 1. These are considered expenses that lower taxable income in year 1. If the farmer has storage capabilities and sells their crop during January of year 2, that sales transaction will be considered taxable income in year 2 (not year 1). The IRS allows farms to choose between cash-based or accrual accounting. A few exceptions apply; a family corporation with gross receipts over $25,000,000 must use accrual methods for taxes. Refer to IRS Publication 225, Farmer’s Tax Guide, for more information. Despite the tax benefits of cash-based accounting, it does not give a clear picture of long-term farm financial health and profitability. Cash expenses for inputs may be pre-paid and revenues from last year’s crop might show up as income this year. This creates a lag in knowing if the farm was profitable during the year. Farmers can use cash-based accounting for tax purposes, but should also keep an accrual-based record to gauge the profitability of the farm from year-to-year.